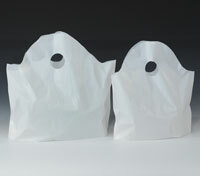 Extra large bottom gusset allows bag to stand alone while packing and can accommodate a variety of food container sizes. Large handle makes carrying easy. Made with high density film for strength. Call for details on custom printing.